I was telling Dean my idea of writing a post on presents I still cherish. He had an even better idea to write sporadic posts with the theme “From the Vault” with each post giving the background and going into more detail on one gift. I like it, but I updated the name to “From the Gift Archives.” So here is the first in a series. 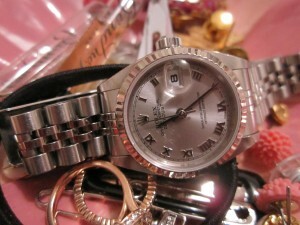 My most treasured gift is the white gold Rolex watch that my parents gave me after I graduated with my MBA. The back story is that I grew up playing with my mom’s watch, reading the date, figuring out the time. Roman numerals were tough on me as a kid. My mom has had her Rolex for as long as I can remember. Over 30 years, at least. As I got older, I told her that I wanted the same type of watch when I finished grad school. I don’t know how much my watch cost. I know it was expensive, especially for my family, which is why I cried like a baby when two years after business school, the watch slipped from my hands and fell onto the bathroom tile. I turned it over, not realizing the worst, and the glass face was shattered. It cost me several hundred dollars to have it fixed incompletely by an official Rolex watch repair shop in Union Square. Some of the shards scratched the internal surface. That would have cost an extra several hundred to replace. I passed. The scratches are visible, but not so apparent that I wanted to spend more money to correct it. As warning or preparation, if anything tragic happens to your expensive jewelry, insurance will not cover damages unless that piece of damned jewelry has specifically been schedule or insured for. I sobbed inconsolably to the insurance agent who wrapped up our conversation by telling me to be extra careful next time. I love my watch. Like I said, it is the most treasured, most valuable item I own. But I also realized how stressful it is to own expensive things. The stress can be pretty severe.